This time last week I was in Connecticut, where it gets dark at night, dark and silent, where there's room to move around, room to cook, room to think. An idyll, really, when compared to NYC sometimes. Of course, I love NYC, but I love to get the heck out every once in a while, too. I mentioned before that we did a tornado of cooking last weekend, but it was strangely restful. Don't you love work that doesn't feel like work? It saves me from feeling lazy. So I have a recommendation for you. Something good if you're having people over and you want an appetizer that's a little stunning. I tell you what, I didn't change a thing here, and I didn't need to. (Okay, fine. I upped the garlic a little. I tend to.) Although I thought the feta I bought was a little on the mild side, and I like my feta strong, so next time I'd search some out with a little more tang (I think that's what you'd call it when describing feta). But otherwise, this was pure delight. I mean, if you're feasting, you've already decided to perhaps eat past the comfort point, so a Savory Cheesecake (!!) isn't really that out of place. It's like the classiest, most delicious cheeseball, without being a kitschy cheeseball, ever. You can spread it on crackers, or eat it with bread, or just plunge in your fork. We all have Julia of Fat Girl Trapped in a Skinny Body to thank, because it's her recipe, she created it. And it's pretty brilliant. Pretty flippin' brilliant. Oh, and if Greek ain't your thing, she has three other flavors to choose from (that Pear and Gorgonzola cheesecake is just screaming to be made). Rub a 9" springform pan with butter. In a small bowl, toss the breadcrumbs and the Parmesan cheese together, then spread them on the bottom of the pan like a crust. Set aside. Use a mixer to beat the cream cheese until it's fluffy, then add the feta, eggs and sour cream. Continue to beat until the mixture is smooth. With a spatula, fold in the red bell pepper, olives, garlic and basil. Pour half of this mixture into the springform pan, then put in the artichoke hearts. Pour in the last half of the cheese mixture. Bake for around 50 minutes (but start checking earlier!) until the cheesecake is golden. Remove from the oven and allow to cool to room temperature. I left it in the pan to chill in the refrigerate overnight, but you should chill it for at least 8 hours. Unmold and sprinkle the rest of the chopped red pepper, feta crumbles and black olives over the top. Serve to your admiring guests. This looks soooo good, so creamy and delicious! A great idea! This is so nice! I was staring at the picture! It is so colorful! Dang, you did a GOOD job!!!!! That looks beautiful. I'm so glad you enjoyed it. Oh, AND I am glad you upped the garlic, because let's be honest, you really can always use more garlic! Where do I even start? This looks amazing! I love having big appetizers for big parties. Things that people can just hang out around and dig into. Thanks for bringing this to my attention! I would never have thought of doing a savoury cheesecake. Beautiful picture! Glad I found your blog. I loave the idea of a savory cheesecake. I have to make this. 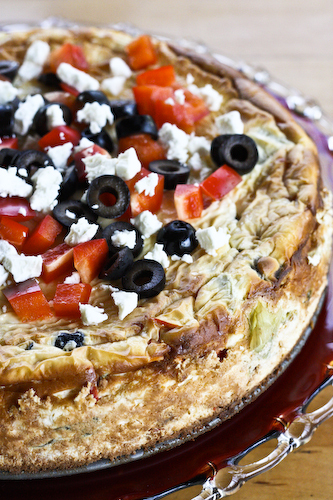 A savoury Greek cheesecake sounds so good! 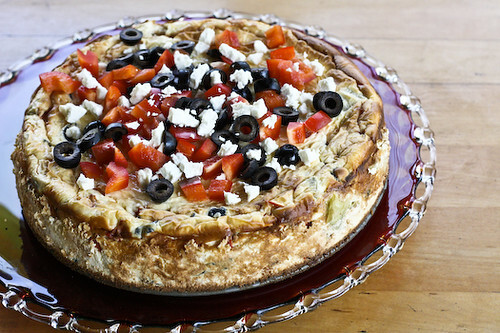 It really looks delicious but to call it "Greek"?!?! How come? Just because it has feta cheese in?